Ring of Kerry - Visit Valentia Island where the tour buses do not go! We can give you a Tour experiencing Geology, Archaeology, History and Mythology. Showing ancient Forts, Abbeys, Churches, Standing Stones etc. Learn about the Cultures that have featured in Ireland's history. When we leave Killarney we will have the National Park on our left shortly we will get our first view of The MacGillacuddy Reeks bosting Ireland’s highest mountain Carrauntoohil. Slight detour to see Cahergal Stone Fort built 500 – 800 AD. Then we go off the beaten track on to Valentia Island by ferry (Seasonal) where we see Valentia Slate Quarry, some amazing views of the Skellig Islands !! Foilhommerum Bay where the first transatlantic telegraph was sent from. Into Portmagee and over Coomanaspig some spectacular views. Then on to the Skellig Ring and of course the Skellig Chocolate factory!!!! None of my tours are set in Stone. We tell people what’s out there as we go along if they want to stop anywhere I'm more than happy to assist. When we leave Killarney we will go via Aghadoe where you can have a look down on the lake & Mountains surrounding Killarney. Parkavonear Norman Castle (which we can walk into). We the go through the small villages of Milltown & Castlemain and on to the Dingle Peninsula, passing Inch beach our first sight of the Atlantic, do you want to dip your toes!!! Aghadoe, Killarney Cathedral, Ross Castle, Muckross House, Torc Waterfall & Ladies View. The main traditional tourist attractions on the peninsula are the ruins of Dunboy Castle, Puxley Mansion, The Copper Mines Museum in Allihies, Illnacullen Island in Glengarriff (maintained by the OPW), Derreen Gardens (privately owned but open to the public). 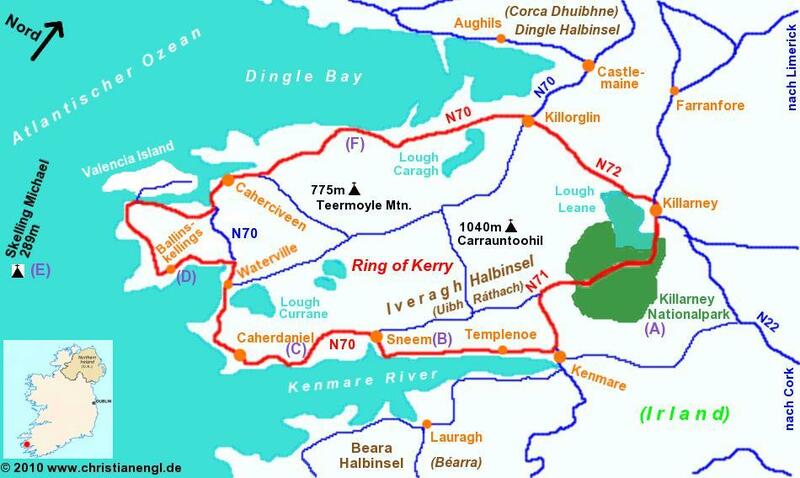 The "Ring of Beara" is a tourist trail for cars which follows the roads for about 195 kilometres (121 mi) circumnavigating the peninsula. It starts in Kenmare, crossing the Healy Pass through Adrigole, passing Castletownbere, Allihies, and turn offs to Dursey Island, Eyeries and Ardgroom, ending in Glengarriff. The area has had a long connection with the sea; Castletownbere is one of Ireland's largest fishing ports and has diving, sailing and boating facilities.